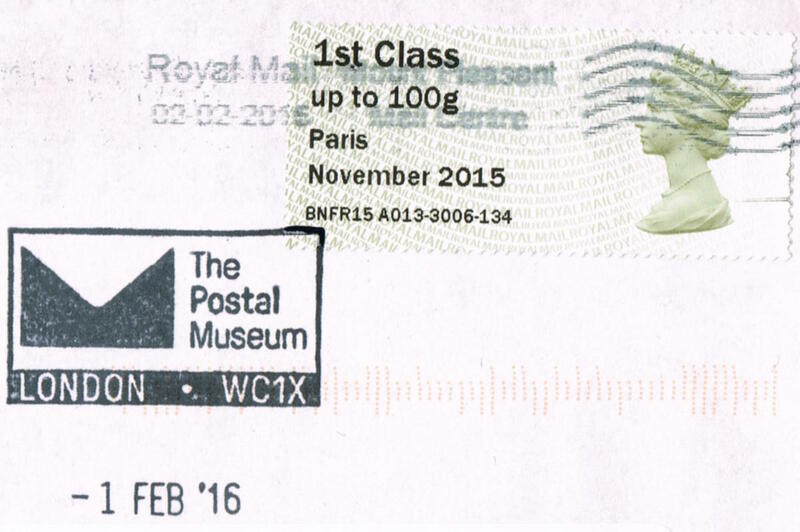 New Logo on Postal Museum Faststamps - But not without problems. As could have been predicted, the production of new Post and Go Faststamps at the newly-branded Postal Museum (see earlier) wasn't without its problems. Trelantis reports that year codes are: Brown Machin MA13, Union Flag Undated, Heraldic Lion MA15 and 2nd Class MA12. I can only think this is deliberate, to allow for extra text to be added, when needed, on the Machins. 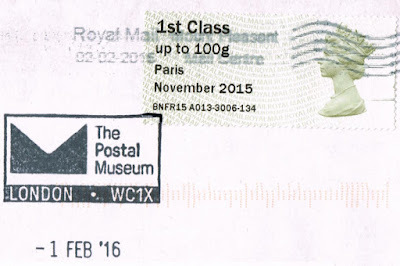 This would preclude any additional inscription on the pictorial stamps, such as the various Transport stamps in the Postal Heritage set, which may be used singly at the BPMA to accompany different exhibitions during the Royal Mail 500 year. Brian reports that the new logo has also been extended to other merchandise, and they also have a different logo for Post and Go. This appears on their website in two forms. The 'negative' form is essentially transparent and I have coloured it so that it shows. It does seem odd to to have two different forms, and have the text in two different styles. An interesting combination of year codes: Machin MA13, Union Flag Undated, Heraldic Lion MA15 and 2nd Class MA12. Also of interest the receipts show the letter A before the £ sign,!!. Interestingly, the A before the £ sign on the receipts isn't an "A", but something called an A-ring (with a little circle over the A), Unicode/ISO 197 for the IT buffs. Before we tell IAR, anyone know if this also appears on the current Machin Open Value ones which also have a £ sign? Does anyone know if the dates codes on the stamps in the Museum's pack vary from those from the machine-vended stamps (as above). They have done in the past. Checked both Post and Go Pack (4 x singles) and also FDC received today. BOTH have exactly the same (Union Flag No Date, Machin 1st MA13, Machin 2nd MA12, and Lion MA15) as listed above. The A before the £ in the price column is Å, whilst the A before the total column is Â.
Whilst it could be a typographical error, it is also a fault caused by the software failing to correctly recognise the extended ASCII set, were the letter/symbol is input in one font, but that font is not available in the font sets recognized by the software. My FDC arived yesterday. Very dissapointed with the blotchy postmark on the cover and the smell of curry. Did not know they are doing scented covers.Anyone else experiencing the same.? I suspect the smell might be the ink?